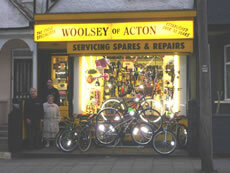 Visiting Woolsey of Acton, the Aladdin's cave of cycling goods, has always been a bit of a nostalgic trip. Now, last year's clever make-over has revealed a more organised and spacious shop. Walls have been knocked down, there is a new Dormer window, new lighting and wiring have been installed along with heating and new carpet. Woolsey is a well-known port of call for many devoted local cyclists. In pre-makeover days if there was another customer in the shop, especially if they had their bike with them, it could sometimes feel a little like standing in a crowded rather chaotic cave. But now the space has been opened out (nooks and crannies were discovered in the make-over which no one even knew existed) and there is space to breathe and even browse the well-stocked shelves which contain everything you could possibly need for your bike. Roger Woolsey even took advantage of the closure of the local Woolworths by procuring the neat display racks which are now house the well-organised displays on the left hand wall. It is the Woolsey family which makes this shop special. Talking to them you get an instant slice of local history. Roger Woolsey lived above the shop until 1974. His father Donald originally lived in Hillingdon and left school at 14 to earn money to help his family. In 1942 Donald was called up. At that time he was working as a milkman for Express Dairies delivering his rounds with a horse and cart. Shortly before he left to join the army, he was told he had a fortnight to show the ropes to his replacement. This turned out to be "a sweet young lady from the South Wales valleys." 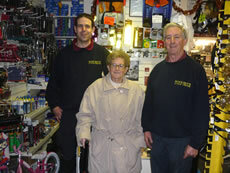 This young lady is now 92 and visits the shop regularly to check on her son, Roger and grandson, Malcolm. Donald and Lillian spent the next 59 years together. They were married before he went away to war and Roger was born in 1946. When Donald was demobbed, he was determined to improve himself. He announced to Lillian: "What I need is a bike shop - and then we can live above it." At the time, they still lived in Hillingdon. The Woolsey shop was at that time called Long Cycle Stores. The business had been started by a Mr Bickford who worked in one of the local engineering firms. He started working on bikes and then opened up his front room as a business. The front bay was knocked out and replaced by a shop window in around 1933 or 1934. (The entire shop front was renewed 15 years ago). Mr Long bought the premises from Mr Bickford just before 1945 and re-named the business which he kept going during the war. He then became irritated by the lack of supplies and sold up to Donald Woolsey in 1955, enabling Donald to achieve his dream of living above a bike shop. Roger moved his family out of the shop as their home in 1974. It is still just possible to see the signs that they lived there - the tyres are stored in what was the bathroom, which still retains its bath; it is easy to imagine Roger sharing bunk beds with his brother in a near-by room, which now houses shiny new childrens' bikes. Each bedroom now houses the Raleigh and Dawes bikes sold in the shop - all suspended in a system designed by Roger. The repair workshop was originally at the back of the garden which was entirely roofed over years ago and houses a larger, businesslike bike workshop. Roger, now 63, is semi-retired. He started working in the family business in 1962 so this year will have been selling and repairing bikes for 48 years. He says: "I've enjoyed the routine of the bike shop but you get extra pleasure from being your own boss." Roger met his wife, Ann, through scouting circles and Ann is still a beaver leader. Malcolm was at first reluctant to work alongside his father, and on the very afternoon he finished school (Twyford C of E High School) he went straight to Ealing Cycles where he had a Saturday job and started working there full time. To sell and repair bikes you now need an NVQ qualification and Malcolm got this and an excellent training during his time working for Woolsey's main competitor. 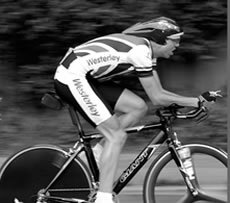 He is a champion time trial competitor and cycles with Westerley Cycling Club based in Ealing. Sadly, Donald died last year of a heart attack. Roger was with him. He regrets that his parents didn't manage to celebrate their 60th wedding anniversary. However, before Donald died, he was told that Malcolm, Roger's son, would be joining the family business and Roger says the knowledge that the business would continue through another generation of Woolseys made his father happier than he had been for years. Malcolm is now a cheerful and constant presence in the shop. The Woolseys are assisted by Tom Newman and Dave Newman (no relation). Both men are bike experts and enthusiasts. This long-running business is looking to the future with confidence. If you need anything bike-related you can't go anywhere better.